I'm so glad that the above stamp set was not put on the retired list. This stamp set is so veritable that I use it often for all seasons. The card posted is for my brother and sister-in-law for their anniversary, December 27th. 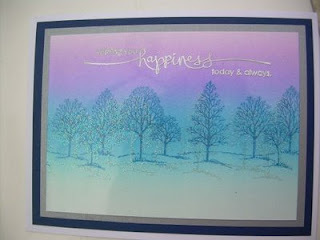 With the weather they have been having up north I thought a winter scene was perfect for their card. I will be teaching this brayer technique at my one class in January. Don't forget you have until Tuesday, December 23rd to benefit from the FREE SHIPPING for orders over $70.00.